In this article I will prove that AGGA is creating forward maxillary movement. But I will also suggest that the physiology of this forward movement is uncertain and that all prospective patients should approach AGGA with caution. Is AGGA Really Growing Bone? Forward maxillary bone growth is the holy grail of adult orthodontics. Many of us find ourselves in adulthood with undersized jaws, a condition which leads to a myriad of health problems and aesthetic shortcomings. In my case, my undersized jaws resulted in compressed neck posture which in turn led to a chronic headache condition. Once we become aware of our undersized jaws and the havoc they wreak on our health, we of course wish to know: is there a solution to this problem? Is it possible to grow the jaws forward? 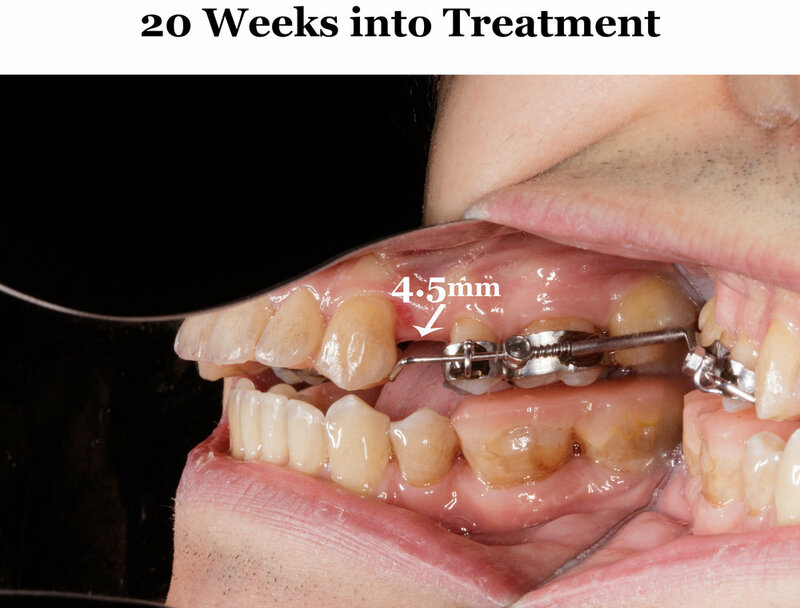 Presently the Anterior Growth Guidance Appliance (AGGA) is emerging on the scene as a device which quickly and painlessly creates the forward maxillary bone growth many of us want and need. We have all seen the photos of patients being treated with AGGA which show sizable gaps being created at the site of the upper premolars as a result of wearing this device. But do these photos in and of themselves prove that AGGA is creating forward bone growth as advertised? Actually they do not. In theory that gap which we see in AGGA photos like mine could be the result of two causes: either 1) the front teeth are moving forward (i.e. forward maxillary growth) or 2) the rear teeth are moving backward. AGGA is only a compelling device if the gap is the result of the front teeth moving forward. If all the device does is move the rear teeth backward then it does not accomplish the primary goal of adult palatal expansion which is to provide the tongue with more space. Before we can conclude that AGGA is in fact creating forward growth, we need additional evidence to show that the AGGA gap is the result of the front teeth moving forward in space. There is a simple written argument I have made elsewhere on this blog which leaves little doubt that the famous AGGA gaps are the result of the front teeth moving forward and not the rear teeth moving backward. The argument revolves around the substantial difference in root structure between the incisors (front teeth) and molars. To suggest that the AGGA gaps are the result of the rear teeth moving backward is to suggest that what AGGA is doing is wedging the front and rear teeth apart using mechanical force. It's suggesting that there is a sumo wrestling match occurring between the front and rear teeth and that the front teeth are winning. The result is that the rear teeth are moving backward in the jaws. My rebuttal to this claim is as follows: a wedging apart of the front and rear teeth would absolutely not result in the rear teeth moving backward in the jaws. The root structure of the molars is substantially more robust than that of the front teeth. Furthermore how could it be that the deeply rooted molars are being shifted backward in the jaws by a force so subtle that I can't even feel it? I have made it clear elsewhere that the force applied by AGGA's center nob can barely be felt at all. It is nothing like the harsh mechanical force of, say, Sagittal appliances. Could it be that the gentle stimulus of AGGA's center nob is somehow moving the molars backward? Unlikely. A picture is worth 1000 words, so let's move on to photographic proof that the AGGA gaps are the result of the front teeth moving forward. GIF 1 below shows that the maxilla does in fact seem to be moving forward in relation to the rest of the face. The animation contains a side profile image from before my AGGA treatment dissolved into a photo from 21 weeks into my treatment. In the animation the nose, eyes and forehead are held constant in the before and after photos. In order to line up my nose and eyes in both photos I had to tilt the "21 Weeks" photo backward which makes it look like I am leaning back a bit. But holding the eyes and nose constant throws the forward movement of the jaws into sharp relief. And what we see in GIF 1 is that upper lip is definitely moving forward in space and the mandible is repositioning itself to meet the now-farther-forward maxilla. The forward movement of both the upper and lower jaws is undeniable. The animation is evidence that the AGGA gaps are the result of the front teeth moving forward, not a result of the rear teeth moving backward. We can also infer that AGGA is creating forward growth by observing visual changes to my neck posture that have resulted from treatment. Therefore GIF 2 below is further visual evidence that AGGA creates forward maxillary movement. In GIF 2 I have not tilted the "after" photo in order to set the eyes and nose constant. Instead, in both photos my head is in its "true" position. Both images show my head and neck just as the level camera captured them while I was positioned on flat ground. What GIF 2 brings into sharp relief is the changes that have occurred in my neck posture. The change in neck posture is striking. We see that the neck has gone from a position of compression to a position of elongation. When the maxilla is undersized, the tongue has less space in the mouth than genetically intended. Unable to come forward, the tongue retreats backward in the mouth and bunches up in the throat. The throat is also the airway, and so the tongue retreating into the throat interferes with breathing. Breathing is one of the body's top priorities, and so the body must find a way to compensate for this blocked airway. What does it do? It assumes a compressed neck, head forward posture. For whatever reason, such a posture opens up the airway in spite of the tongue blocking it. This dynamic MRI illustrates how neck posture can effect the airway. With the neck compressed, the airway is more open. With the neck elongated, the airways closes. So back to the question at hand: how does the elongation of my neck posture indirectly prove forward maxillary movement? By moving my maxilla forward AGGA gave me more tongue space. With the additional tongue space, my tongue has come forward out of my throat, thus clearing my airway. With my airway clear of any obstruction, I am able to breath well even with my neck in an elongated position. I must mention also that throughout my AGGA treatment I have done plenty of neck exercises and neck self-massage. But I had been training my neck for years before AGGA with poor results, and only once AGGA provided my tongue with the opportunity to clear out of my airway have I been able to habituate elongated neck posture. GIF 3 below is a front facing view of the transformation that has occurred during my first 21 weeks of AGGA treatment. Significant change can be seen everywhere, but especially at the site of my lips. After 21 weeks my lips have become higher and more prominent, as if I've had a lip job. I believe this too is evidence that the maxilla is coming forward and buttressing my upper lip into this more prominent position. What I have proven in this article is that AGGA moves the maxilla forward in space. But the exact nature of this forward movement remains in question. Is it sturdy? Is it safe? Is it compromising the front teeth? As far as I'm concerned I think these are legitimate questions which need to be answered by dentists who are qualified to do so. I am not a marketing agent for the Las Vegas Institute (LVI). LVI is the company which owns the rights to AGGA and profits from its dissemination. I gain nothing by promoting AGGA. 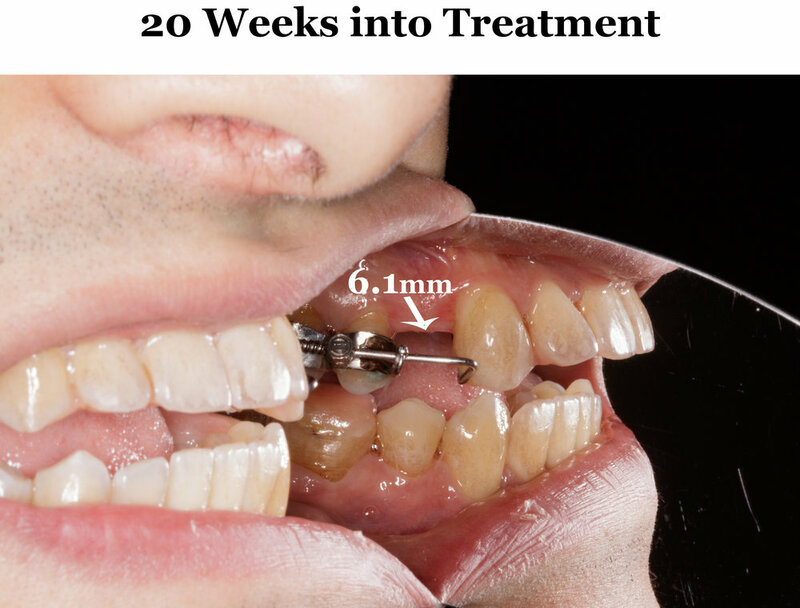 The only reason I do so is because a large part of me believes that it is the miracle forward maxillary growth device I was seeking for many years, and I want to share news of it with others for their own benefit. For this reason I wish to take an uncompromisingly fair and balanced approach to my discussion of AGGA. So I want to declare the following right now for all readers to see: I do not think the case is yet closed on whether or not AGGA is safe. Yes, AGGA is creating forward maxillary movement. But the exact physiological process behind this is a mystery which I cannot explain. In the past I have described the process as AGGA dropping bone between existing structure like clicking "Insert Row" in Microsoft Excel. Of course this is what we all hope and wish is occurring. But it may not be. It may be that AGGA is moving the front of the maxilla forward in a way which is dangerous and compromises the front teeth. I really don't know. The following image shared in the Craniofacial Pain Group on Facebook shows before and after x-rays of an AGGA patient. I am not a dentist and cannot provide a sound technical intepretation of the x-ray. But I definitely find it concerning. The front teeth in the "after" photo on the right seem...sketchy. I am especially concerned because my own front teeth are beginning to tilt forward like in the x-ray photo above. In fact at my most recent visit to Dr. Kundel he decided only to partially adjust my AGGA's spring out of concern that movement is occurring too quickly in my case. It may be that there is nothing wrong with the maxilla and teeth as seen in this x-ray. I don't think we can conclude from the x-ray, as some have, that the incisors have been "taken right out of the bone" and are "hanging in just by the soft tissue." In AGGA's defense, I think it is possible that the incisors in this x-ray are buttressed by supporting bone which has also moved forward as part of the AGGA process. Also in AGGA's defense I will say that I am not experiencing any pain in my front teeth. If my incisors were being severely compromised I think that I would feel it, as I did during my treatment with Sagittal appliances which were very painful as a result of the forces being applied against the teeth. In my own case I am going to proceed with caution. If the forward movement caused by AGGA is unsafe then it is me who needs to know about it, since I'm the one who's got the thing in his mouth. As for you I would suggest the following: don't jump the gun on AGGA. Wait to see how my case plays out before buying in. If it turns out that AGGA is unsafe you will hear it here first.